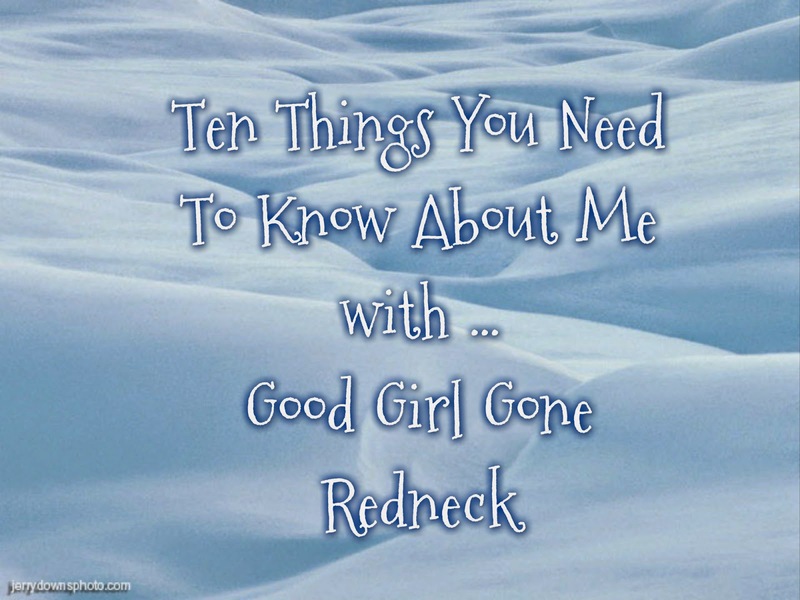 Good Girl Gone Redneck: Ten Things You Need to Know About Me. Ten Things You Need to Know About Me. My lovely friend Tia over at BecominNeurotic tagged me in a post on Friday with some questions. And because she is quite so lovely and a sweetheart and a half, I'm open to answering them. Her friend asked her some questions, which she answered, and then she decided to ask me and some other fun peeps some questions, too. It's old school blogging - and it's perfect - because I'm in need of a post prompt and this seems to be it! 1. What would you do if you were not a blogger/writer? For the most part I'm doing it. But not nearly enough. I am a social worker and a part of who I am always advocates for mental health causes. I volunteer for many organizations, and I work part-time from home, but a goal is to someday have a job where I can work with women face-to-face to help them overcome whatever struggles haunt them as they try to find sleep at night. That I walk my daughter down the aisle and witness her world as she becomes a mama someday. 3. Do you have a sisterhood? A group of girls not related to who you can turn to no matter what? I literally (love the over-use of that word, right?) have a sisterhood. I was in a sorority in college. These girls ARE my sisters. So yeah. I do. I've got friends scattered in different areas of my world. I've got incredible sisterhoods filled with friends from my youth. Friends from work. Friends from motherhood. Friends from blogging. Each aspect of my life filled with friends I have made, women I have met and loved. Poured my heart out to. Still do. And my sisters. There aren't enough words to fully describe what they mean to me. Have you ever watched a movie or TV show with a sorority? if so, you likely know the supposed "sorority girl". But the stereotypes don't show the amazing friendships that come from the experience. The friends that show up to hug you when you need it the most. The emails, the phone calls, the notes and messages. The love. The feeling you get when you see that person who gets you, no matter how long it's been. These women? They're sisters to the core. I'm truly blessed at the number of women I have in my life who represent family to me. 5. Name your ultimate comfort meal. The meal that would heal your soul and cure the worst of days. The meal you want Willy Wonka to make into a stick of gum. With dessert. This is a tough one. But I don't think I'd want it in a stick of gum because my senses would be on overload and I'd probably get sick. Plus, I don't think I'd make a great giant blueberry. 6. What actress would play you in a movie of your life? Why? 7. What one movie can you watch time and again? Dirty Dancing. I haven't seen it in a while but it's always my answer to this question. Also - favorite movie of all time. It takes me back to the time I first saw it. And Patrick Swayze, people. Ahhh. My heart shattered when I learned that he had passed away. It impacted me so much I even wrote about his passing. So sad. 8. What is your favorite thing about each season? Winter: I really do love how beautiful things look when it snows. A full-fledged blanket of snow on everything just evens it all out. And hot cocoa when you come inside after playing and your thighs are red and frozen. Spring: My husband and I got married in April. We will be celebrating our 13th anniversary this year. On April 13th. Memories of that day are so important to me. They make me laugh, cry, and feel so so much. Spring represents that to me. Renewal. Connection. Love. Summer: Getting out on the lake. Having a boat is a surprising joy. I absolutely love being out on the water. It just makes the entire day perfect. We set out and breathe in the fresh air, hold onto the sides of the boat as we make waves or hit someone's wake. I feel like I have no concerns when we're out there and I love that feeling. Fall: October used to be my favorite month. Between my birthday (28th) and Halloween (31st - of course) I had two of my favorite days of the year happening in one month. October isn't quite the same for me anymore as it now holds several of my life's worst moments, but I try to hold onto the feelings that fall used to bring me. The cooler air, the nights of shorts and sweatshirts, kind of like when you walk on the beach in the chill of dusk. And that I'll always love. 9. Which 5 songs can you not get out of your head right now? 10. Which historical figure would you like to go back in time to meet? Why? I'm so used to answering this question with a general person from my past. And for me that answer has always been my grandfather. But differently than for most, he's the grandfather I never met. My father's father. The man I'm named after. So while he's not a historical figure, he did live through so much, and lost his first family in the war, and I have my own memories of him based on what my parents have told me. And as many of you already would imagine, my answer to the one person in the world I'd most want to sit down and have a meal with right this second is my father. So I try to take comfort in him being reunited with his own father again. And telling him all about me. So, there you have it. Ten things about me. I hope you've enjoyed them. And if you're looking for a fun prompt and want to answer some questions about yourself, feel free to steal these. Or let me know and I'll send you some. Or just make up your own. Ten facts about you you'd like to share. It's kind of fun and gives you a post idea immediately. So yay for brainstorming and friendships! That is old school isn't it? I'm kind of glad they're not really a thing anymore (ok, really glad! )...but you did make it into an interesting read! I loved all your answers! I know fall will always be hard for you, but hopefully it will gradually have more good in it again soon. Sometimes I miss this type of old school blogging, so I'm really glad you did this! I love learning a bit more about my blogging friends! You made me realize I need to appreciate winter more. So much fun to learn more about fellow bloggers. Given all that I'm going through right now, the fact that you mention the long lasting connection to your sisters really hit home for me.